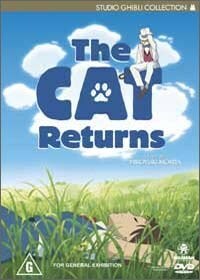 The Cat Returns is a beautiful anime movie directed by Hiroyuki Morita (Spirited Away fame) that revolves around a young teenage girl called Haru who gets more than she bargained for when she rescues the son of the King of Cats. Although Haru has the innate ability to talk to cats, the King offers his son's hand in marriage as a reward for Haru but fortunately for our young heroine, the Baron comes to the rescue in this charming and comedic look at the world between men and cats. The disc also contains some great special features that include a 16x9 widescreen presentation, alternative angle storyboards, the extremely entertaining original Japanese trailer and the thought provoking making of, the Cat Returns. The video quality of the Cat Returns is brilliant and Morita nicely adds a touch of CGI into the animation to help draw the viewer into Haru's enchanting predicament. Best of all, this DVD features Dolby Digital 5.1 with exceptional sound quality. This movie presents the option of both the Japanese and English soundtrack for your enjoyment. In conclusion, this movie comes highly recommended and even those who find Japanese animation a little over the top, this movie will draw all viewers into the wonderful world of Morita who really gives our heroine a true humanistic approach to this strange world of talking beasts.